Our group is interested in developing advanced synthesis approaches of functional nanomaterials and exploring their applications in flexible electronics, wearable energy devices and environment. 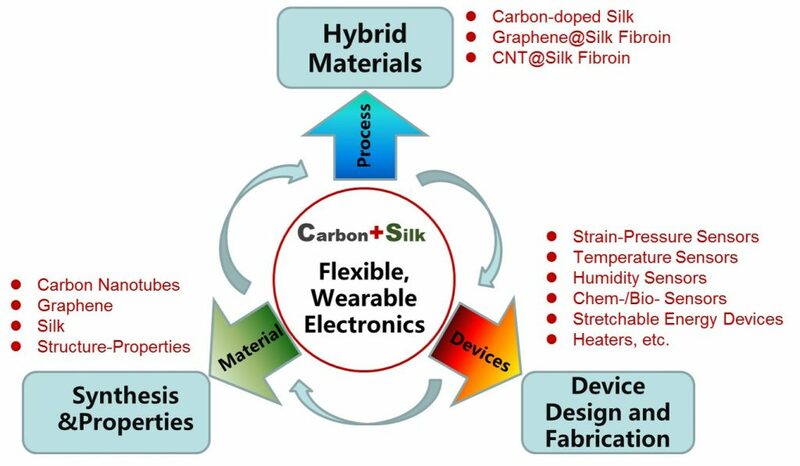 Currently, we mainly focus on the synthesis and basic understanding of Carbon Nanotubes (CNTs), Graphene, Silk Fibroin (SF), their hybrid materials, toward their applications in high performance, flexible and stretchable electronics and smart wearable systems. In the past several years, we have reported the feeding of CNTs and graphene to silkworms for enhanced silk fibers, high performance strain-pressure sensors based on carbonized natural fiber fabrics, silk E-skins, silk nanofiber air filtration membranes, CVD growth of pentagon-shaped graphene, CVD growth of the world’s longest CNTs, optical visualization technique of individual CNTs and monolayer graphene, experimental observation of superlubricity in double-walled carbon nanotubes, etc. Our results have been highlighted by Nature Nanotechnology、C&E News、Scientific American、 PhysOrg.com、Nanotechweb、Nanowerk、Advanced Science News、Materials Views、Washington Post etc. Dr. Yingying Zhang has authored more than 90 journal papers, including Nat Nanotechnol、Nat Commun、Adv Mater、JACS、Nano Lett、ACS Nano、Adv Funct Mater etc, with more than 2299 citations (Web of Science). Besides, she has authored 3 book chapters, and 26 patents (14 awarded).